Truly lovely, Terri. The colors you used are soft and feminine, the written letter to your grandmother is so touching, and the memories you are sharing about her in this little book take my breath away. Congratulations on your new class....I know it's been alot of work to prepare for, but the effort and heart you put into it (as with everything you do) is worth it for your students (and you) to share in the experience of creating these books. That is so pretty. I can see that a lot of love went into it. What a wonderful tribute. Such a beautiful tribute in miniature! I do love your domino books! I need to Pinterest this because I will want to actually schedule time on my calendar in the future to really see how you do these precious keepsakes! What a gorgeous way to remember your Grandmother. It's just beautiful! And the letter on the back of it is so touching. And congratulations on your class! OMG what a wonderful little book Terri. I´ve missed my words. Just lovely!!. I'm looking foward to do one. I love the feets, and the "royal crone" on top, and how the bird flyes into two pages.What a beautiful memory keeper. I wish you big luck with your class, I know it will be wonderful. Fantastic and very classical! So sweet of you to come up with an artistic tribute as that. Hi Terri, what a beautiful treasure! The letter is the perfect finishing touch. Oh what a wonderful idea Terri! And wouldn't that make an awesome Christmas gift for family members? Yours turned out so beautifully, a real treasure! Terri, your memory book of your grandmother is absolutely wonderful. So gorgeous and beautifully created. What a treasure and tribute to her memory. Kudos to you and your endless talent and creativity. Hugs, Gayle. Wow, amazing dear Terri, I love this fabulous Domino Book !! Have a great day and love visiting you. A very beautiful domino book . . . and so very sweet and sentimental! A quick glance via iPhone & I love this. Another look & comment via computer later this week. Love it! Terri, your teacup is beautiful and certainly dramatic. I was thinking how precious and vibrant the little bouquet at the bottom of the cup looks even amidst the black and gold which seem to overpower it, as if to imprison its sunny disposition. Yet it shines through. Your domino tribute book is so pretty. I miss my grandmother, too. Together we watched the birds come to her yard to eat and bathe, and she take out her bird book to identify the birds we saw - like the tufted titmouse. Thank you for sharing your lovely things, as always. This is beautiful! 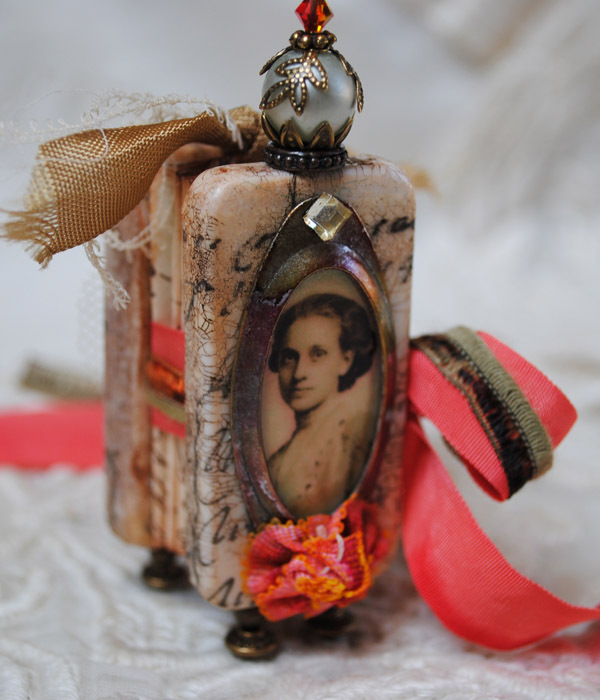 Now I want to make one about MY grandmother!! Great inspiration. Hi Terri, I hope that you're doing well today! 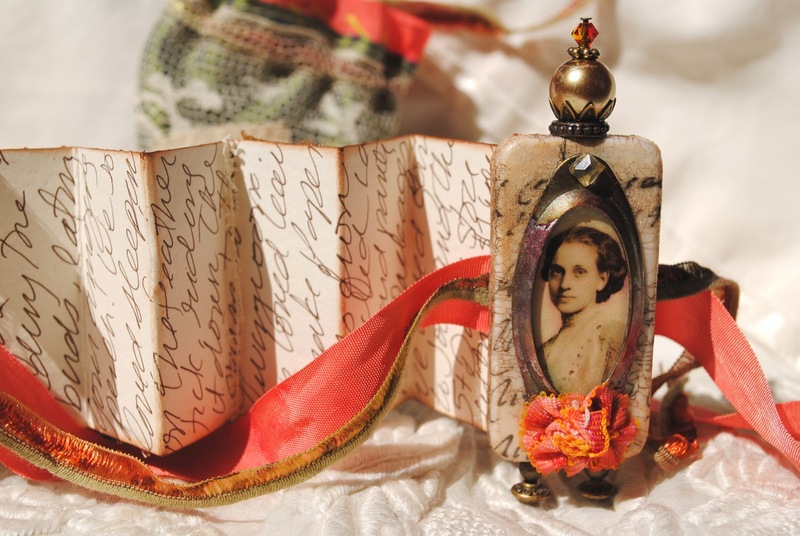 What a lovely Memory Domino Book/Keepsake and tribute to your grandmother! It's beautiful and filled with happy and heart felt memories of love! Something I'm sure that will be treasured for many years to come! I hope that you have a wonderful rest of your day! Such a wonderful little keepsake. Very well preserved memories that can be carried down for centuries! Beautiful, very beautiful! What a beautiful and thoughtful tribute. Lovely! Beautiful work and I do love your teacups! Hi Terri! 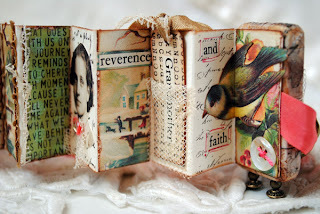 I just pinned this beautiful domino book of yours from someone else s board because I just fell in love with it! 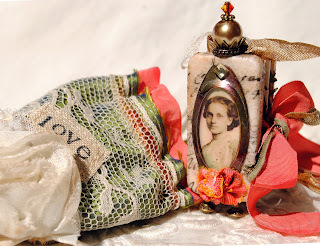 What a fabulous tribute to your grandmother and such a sweet keepsake. I love your color combo here too! You are such a talented person!